Posted on August 23, 2018 by Kelly M.
We got lucky on Saturday: it only started pouring after the end of the farmers’ market. With that, customers were able to come out and bought up every last watermelon and cantaloupe! Thanks to the crew and volunteers who pitched in during Friday’s hot and humid market harvest. We would have been out there until dark had we not had extra help picking beans, peppers, tomatoes, and flowers. The possibility of preservation can arise through the communities that form around open spaces, farms, rivers and beaches. It was volunteering on a family farm in Iowa that changed my direction. And thankfully, Louise Hatheway foresaw the need to preserve Drumlin Farm as a gathering place for those drawn to agriculture and nature. On Saturday, despite our soggy selves, six community volunteers and three farmers together harvested 800 pounds of spaghetti squash! 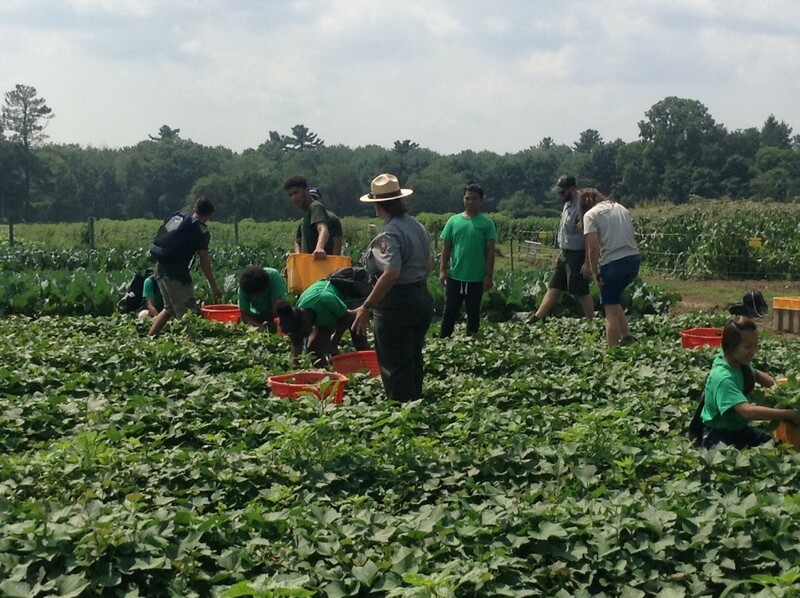 And on Thursday, teacher-naturalist Sally Farrow once again welcomed Lowell high schoolers in the Spindle City Corps to the farm (pictured). These teens have spent the summer working for the park service. While here, they helped us weed, and they also spent time with the Wildlife Care and Livestock staff. Thanks, all, for making Drumlin Farm a magical meeting place where lives cross and are transformed. Our Fall CSA begins in just 3 weeks! Register today to secure your share of fresh local produce throughout fall. This entry was posted in Farming and tagged crops update, csa, farming, food, local on August 23, 2018 by Kelly M..